Coral reef experts and climate scientists agree that due to rising temperatures, Australia’s Great Barrier Reef is pretty much fucked. 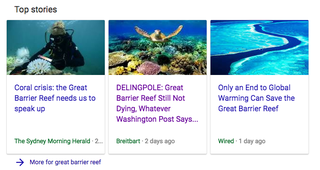 But when you search Google for “Great Barrier Reef,” that’s not all that you’ll find. Instead, at the very top of the page in the Top Stories module, you’ll see a Breitbart article dismissing the damage done to the famed coral reef that sounds like it was written by a college Republican who hasn’t slept in 72 hours. Listen, this guy says he’s been to the Great Barrier Reef himself, folks, and did he see any of this phony liberal globalist scheme known as “climate change?” Nope! The Great Barrier Reef is one of the most celebrated ecosystems on Earth—and it’s dying. Months of extreme heat have turned thousands of miles of pristine habitat into an endless watery graveyard. This year’s coral bleaching event comes as a warning. If we don’t bring carbon emissions down fast, the Great Barrier Reef will not survive the century. The danger here is that when someone impressionable or undecided on the veracity of climate science turns to Google for some more information, they get served with the ravings of Breitbart. This is not good! Google has a responsibility to serve accurate information in its news module—which, let us state for the record, is at the very top of its search page—and this climate science denying diatribe is far from that. We’ve reached out to Google and will update this story if we hear back.